When you work downtown you don’t have a lot of options for quick and cheap-ish breakfast other than McDonalds, Tim Hortons or Starbucks. They are serviceable and in one instance over priced for what you get (I’m looking at you Starbucks). The easiest things to grab & go are breakie sandwiches. However the ingredients used in the sandwiches are somewhat disappointing. Who wants to eat limp bacon? Sometimes I cut through the cul-de-sac where the Chinatown T&T supermarket is located to get to work. Every once in a while the wonderful scent of bacon wafts through the air. I just assumed someone from one of the surrounding condo towers was having a very happy bacon breakfast. Finally one day the bacon smell was so strong I knew it could not be someone just cooking breakfast. I followed me nose and arrived at Brothers Café. 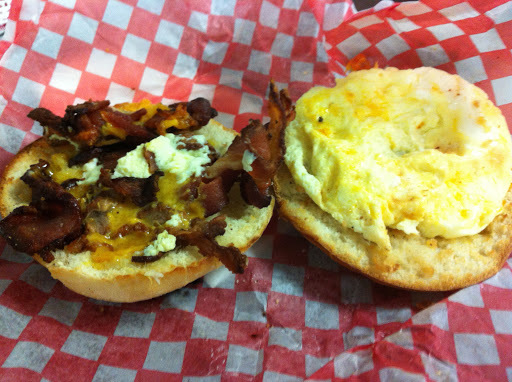 Located in the same cul-de-sac as the T&T, this place is a hidden gem for Breakie Sandwiches. The place is a classic mom & pop operation, which is rare in downtown Vancouver. The husband prepares the sandwiches and the wife takes the orders. For $3.25 you can get either a bagel sandwich filled with bacon, egg & cheese or a croissant sandwich with ham, egg & cheese. My preference is the bacon bagel simply because you get crisp bacon and lots of it. They put the bacon and cheese on one half of the bagel, along with the other half into a toaster over. While that’s toasting, they make the egg. The egg is just like the egg you get in a Tim Horton’s or Starbucks sandwich. However I get kick out of how they make it. They beat an egg in mug and nuke it. Once cooked, it pops out of the mug in a perfect circle and is still fluffy. The bacon is the key. It’s thick and crispy which blows away the limp bacon sandwiches that the fast food chains sell. 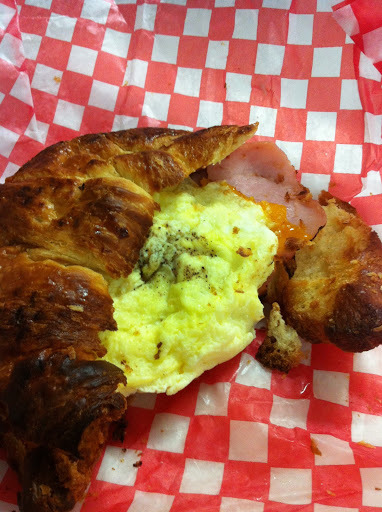 The ham croissant is good too and I order whenever I feel like I need to be kind to my heart. Both are well-made breakie sandwiches, like something you would make at home, comparable in price and better value than the fast food chains.